228 pages | 14 B/W Illus. Imagination and creative teaching approaches are increasingly important across all higher education disciplines, not just the arts. Investigating the role of imagination in teaching and learning in non-arts disciplines, this book argues that a lack of clarity about what imagination looks like in higher education impedes teachers in fostering their students’ creativity. Fostering Imagination in Higher Education tells four ethnographic stories from physics, history, finance and pharmaceutical science courses, analytically observing the strategies educators use to encourage their students’ imagination, and detailing how students experience learning when it is focussed on engaging their imagination. The highly original study is framed by Ricoeur’s work on different forms of imagination (reproductive and productive or generative). It links imaginative thinking to cognitive science and philosophy, in particular the work of Clark, Dennett and Polanyi, and to the mediating role of disciplinary concepts and social-cultural practices. The author’s discussion of models, graphs, strategies and artefacts as tools for taking learners’ thinking forward has much to offer understandings of pedagogy in higher education. Students in these case studies learned to create themselves as knowledge producers and professionals. It positioned them to experience actively the constructed nature of the knowledge and processes they were learning to use – and the continuing potential of knowledge to be remade in the future. This is what makes imaginative thinking elemental to the goals of higher education. 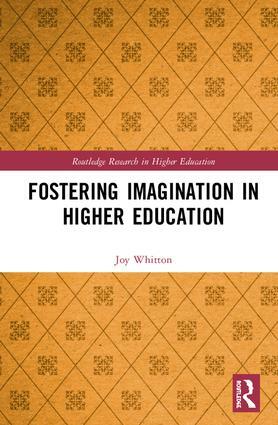 Fostering Imagination in Higher Education provides a unique account of how university educators foster the imagination, especially in disciplines not typically associated with imaginative thinking. Whitton skilfully integrates Paul Ricoeur’s theory of imagination with a wide range of other literature on the imagination, creativity, and learning. Using this robust theoretical framework, she details three ethnographic studies: a fourth year physics course; a first year history course; and a post-graduate finance course. In doing so, Whitton provides many diverse examples of imaginative teaching practice — practices that can easily be applied in most higher education contexts. If there has ever been a time when we need to encourage students and teachers to use their imaginations, it is now. This is a ‘must read’ book for any teacher who wants to improve their understanding of imagination in learning. It makes a significant contribution to understanding the nature of creativity in higher education teaching and learning and other practices. The ethnographic case studies reveal the significance of imagination, productively connected to perception and reasoning, in the cognitive apprenticeships of learners: the important point being that while they learn how to use their imaginations like practitioners in the disciplinary field, they bring their own unique selves and history to what they imagine. The imaginative way in which theory, practice and research have been connected and blended into a new synthesis, will stimulate any teacher’s imagination to develop new practices to encourage learners to use their own imaginations. This beautifully written book is both scholarly and practical and a compelling read. Drawing on an ethnographic account of creative pedagogies in non arts-based subjects in a research-intensive university, Joy Whitton argues that imagination and creativity should be taken seriously so that all university students are helped to think beyond "what is" to "what might be". Her argument is that graduates need personal attributes that enable them to tackle the complex problems that continue to beset society. Ever sympathetic to the demands of working in Higher Education, Whitton offers ways of conceptualising creativity and imagination so that they can easily inform how we work with students. Strongly recommended. Joy Whitton is an academic developer at Monash University in Australia. Her research interests include imagination, cognition and their interplay with tools/artefacts and practices, and professional learning.